We've been enjoying printing some square-format business cards lately. A little while ago, we worked on some amazing fluorescent pink square cards for David Ceraso and we've just finished printing business cards for a newer client, Roma. 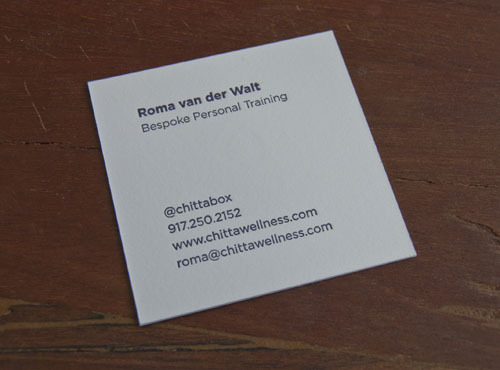 She is starting a holistic personal training business and we worked from her own designs. When she came in to meet with us and discuss what kind of card stock she wanted, she saw a sample of a square card and immediately fell for it! Good luck with the new business, Roma!